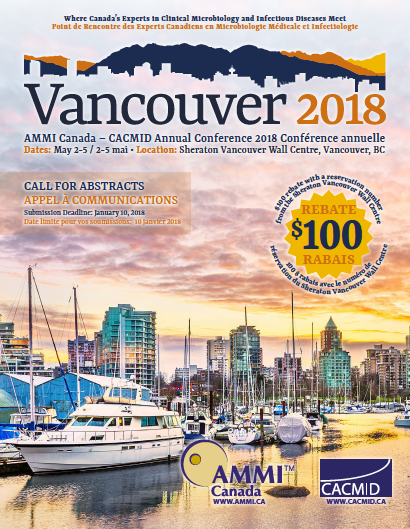 We are pleased to announce the 2018 AMMI Canada – CACMID Annual Conference will take place in Vancouver, BC, from May 2-5. The Abstract submission site is NOW OPEN. Submissions are also being accepted for the interactive Clinical Vignettes. We welcome your participation! For all aspects of clinical microbiology and infectious disease including epidemiological, diagnostic, environmental, medical and basic sciences. Abstracts related to education in microbiology and infectious diseases are also welcome. N.B. : To be considered, an abstract must comply with the rules of submission set out by the Abstract Committee. For challenging and head-scratching cases, with a clear teaching point or two, and presentation during this interactive session. *Hotel rebate offer applies to full conference registration only. One rebate per hotel room. Offer available while rooms are available – book early and don’t miss out!